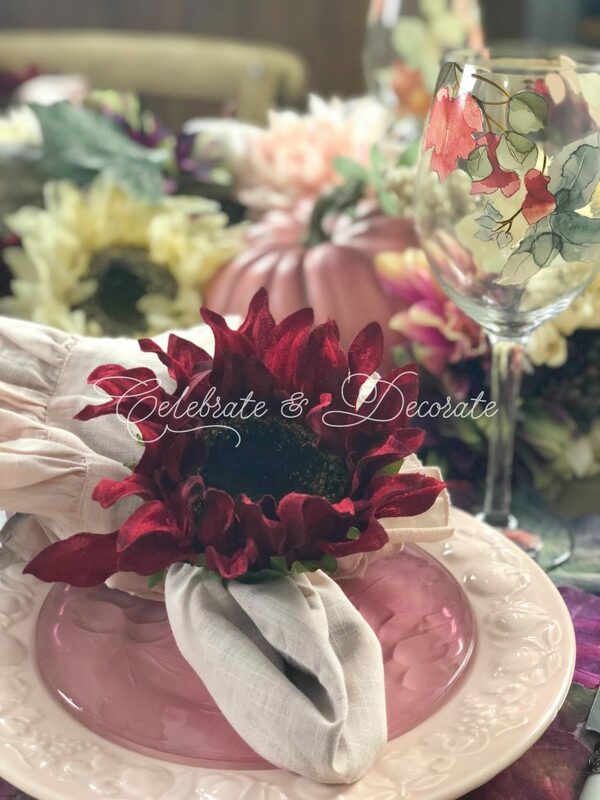 I am so happy to once again be hosting a group of talented table stylists to share their talents in designing a fall tablescape. I hope you have been touring those who have already posted this week, if not, check out the links at the bottom of this post! When I spotted these plum and pink pumpkins at Michael’s, I was immediately thinking about how I I could use them this fall. When I started planning my table, I was excited about using something other than the typical oranges and yellows of fall. Soft pink napkins with ruffled edges were a great find at Pier 1, but I thought a dark purple napkin folded inside of them gave them a more substantial feel. Those stunning wine glasses also came from Pier 1. I used artificial sunflowers to make my napkin rings, just as I have done in the past. The pink dinner plates and salad plates are dishes I have had for years. Soft gray flatware from The Pioneer Woman collection were complemented the soft look I wanted. My centerpiece is simply two artificial garlands, one with flowers, one simply greenery. I added the burgundy and ivory sunflowers to my garlands and nestled my little white pumpkins and my pink and plum pumpkins down into the garland. Don’t stop now! Check out all of these talented table stylists and their gorgeous tables ready to welcome Fall to the table! Thank you so much Mary! Yes, it would be lovely to be enjoying some fall temperatures! I am looking forward to a fall drive from Ohio to Florida to move one of our cars for the season and hoping to see the changing leaves along the way! Chloe, you are such a talented lady! Love this plum & pink palette, is original, elegant and romantic! Thank you for this beautiful blog hop! Oh Donna, thank you so much! Thank you for once again joining us in another blog hop! 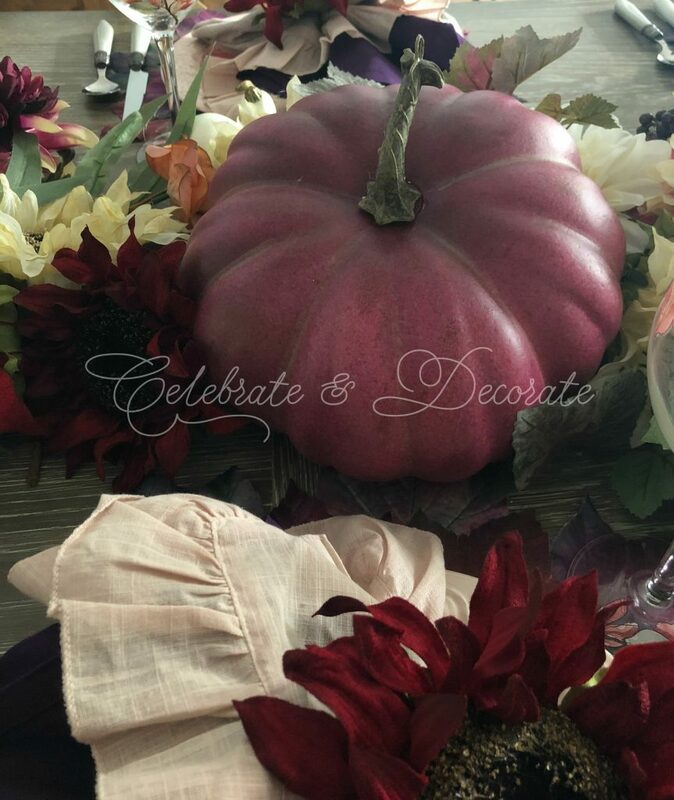 I love your beautiful Fall tablescape design using plums and pinks, Chloe! I was excited to see the colorful pumpkins at Michaels, too, and just had to pick them up! They are quite lovely! Thank you so much Gail! Those soft colors are so refreshing, aren’t they? Chloe, what a lovely and soft transition into fall. I love all the shades of pinks, burgundies, and creams that you used. The sunflower napkin ring is a perfect addition to your table. The garlands with the pumpkins add just the right touch of autumn. Thank you for organizing and hosting the blog hops. They are always fun, it is a pleasure to participate! Thank you so much, Pam. It was so much fun to mix it up for fall with some different colors this year! Chloe, You are a good leader and example. Thank you for organizing and administrating the blog hops. 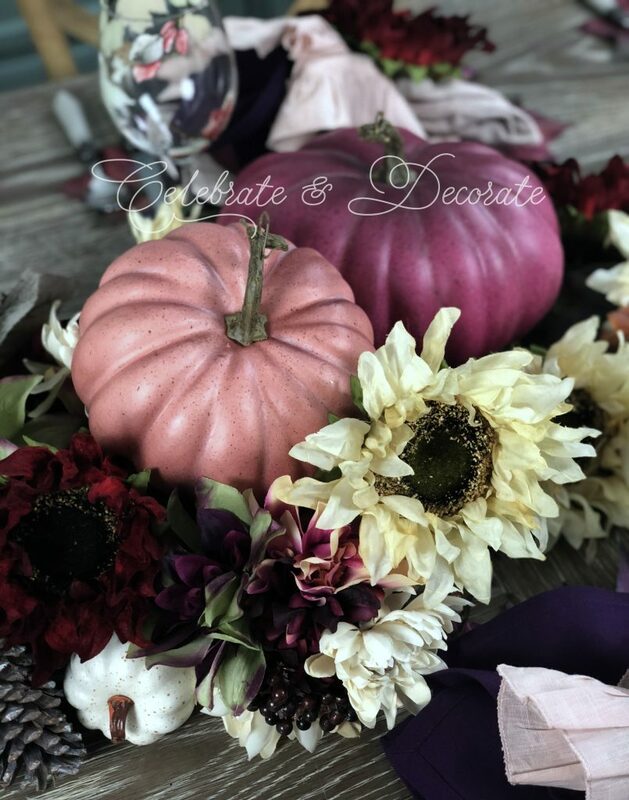 I love your soft fall colors in your tablescape. Your creative runner and napkin rings are stunning. Pier 1 should commission your work to their line. Those wine glasses were a great find and perfect for your table. Thank you so much for your kind words, Bonnie. You are so sweet! Oh, yes, I couldn’t resist those wine glasses, but was REALLY happy they were on sale! I am so happy to have you continue to join us and share your talents in styling tables! Chloe, you’ve done it again — a gorgeous tablescape! I just love the unique color palette; I might have come up with purple for fall, but never pink. It not only works, it’s brilliant. It’s also a great color choice to transition to fall. Cool colors in this heat wave. And how very clever is your centerpiece with it’s two garland foundation? I’ve gotta try to make those napkin rings sometime soon. Thank you so much Debbee! Those pumpkins from Michael’s set it all in motion! The napkin rings are so easy, but I my napkin ring bin is overflowing! Thank you so much for joining us for another hop! Ooh, Chloe, I love it when a table surprises me like you’ve done with the colors on this one! The double napkins are a great combination (yes, love that deep, rich plum), and the napkin rings too. That’s a a great look on your dining table wood. Thank you so much for coordinating this fall theme of tablescapes. It’s a pleasure to be among the group. Thank you so much Rita! 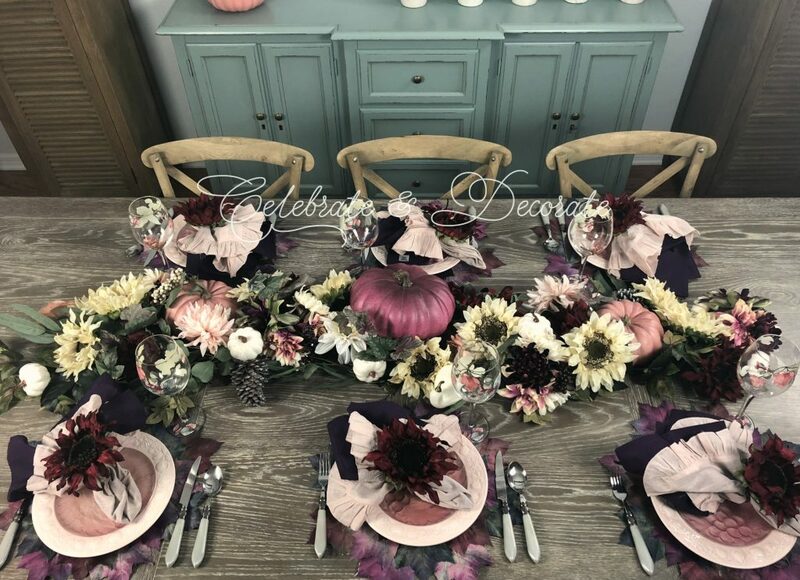 I always think how am I going to change things up and not style a table the same way I have done for previous fall tables and those pumpkins called to me at Michael’s and I was all set! Thank you so much for joining us in the hop again! W-O-W factor! What a creative and inspirational tablescape and do-able. Who wood-a thunk it? Purple and pink pumpkins!!!! Love them and your creativity. Your tablescape is stunning and enchanting as you have added elements that compliment and enhance the existing. The place mats are gorgeous as well as your gray flatware. We all say the same thing about your DIY napkin rings and one of these days I am going to make more. (I did make one set a while back) So simple yet elegant. 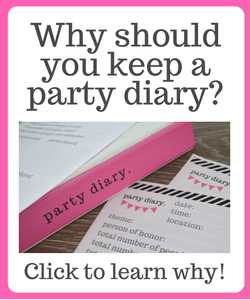 Great job my friend and thank you for hosting this blog hop. You are like the energizer bunny …I should be so lucky. 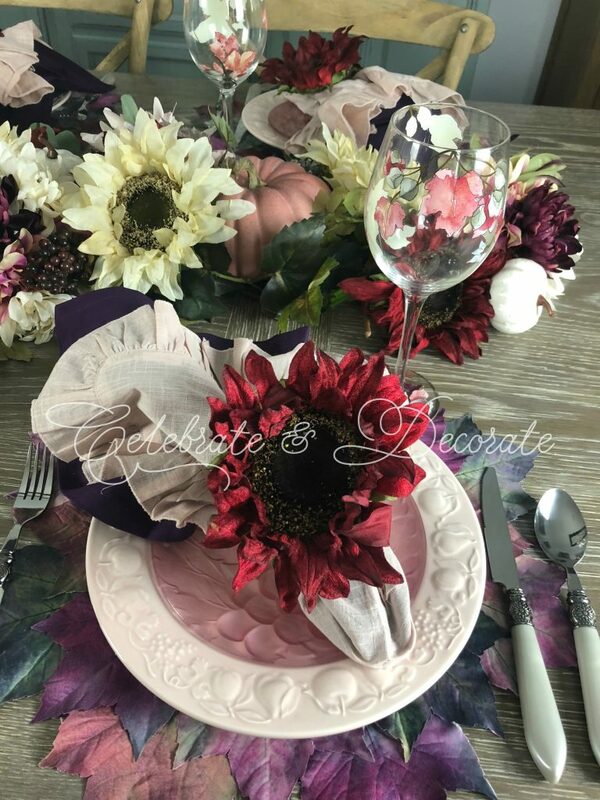 Chloe, I love your pink and plum color theme on your tablescape! The touches of white sunflowers and pumpkins accents everything else nicely. And your gorgeous plates have me swooning! 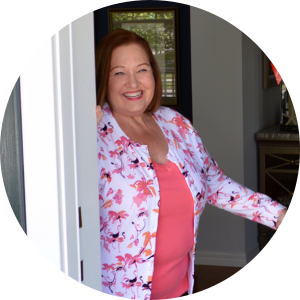 Thanks so much for including me in the blog hop – it’s been a ton of fun! What a beautiful color palette for fall! This table has a quiet elegance about it and those velvet pumpkins are everything. Beautiful styling and thanks for bringing us together again. Thank you so much Sandra. I was so happy with the color of this one. thank you for joining me in another hop! WOWSA! I just love your color scheme Chloe! So many gorgeous details here. Thank you so much for hosting. What a great hop! Thank you so much Amber, and THANK YOU! for joining in the hop! Chloe, what a beautiful fall table. The pink and plum are so unexpected, but a beautiful look. I do love that look. I never knew there were such colors available. The napkin rings are lovely. I have made some myself. The garland make a pretty centerpiece with those amazing pumpkins. Gotta love the leaf placemats and the glassware. Lots of fun inspiration. 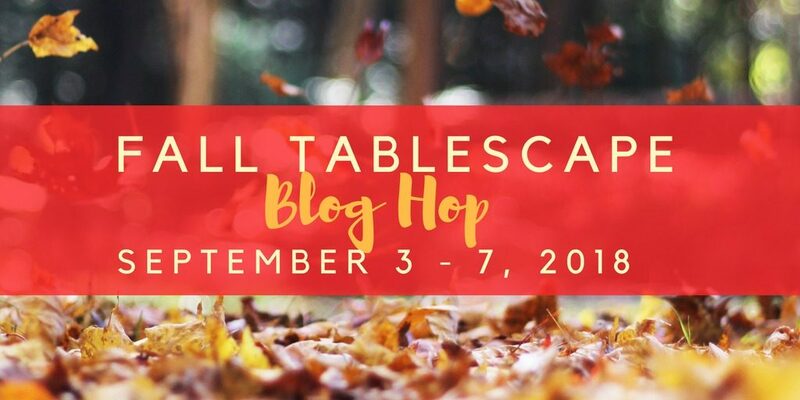 Thank you for sponsoring this fall tablescape blog hop. You have such a creative and talented touch, Chloe! I love that you used non traditional colors for this tablescape. And those sweet sunflower napkin rings are too cute. It looks like everything vignette you put together is done with such ease and beauty. Lovely!! Thank you Wendy! I am always on the look out for a different take on a tablescape and the non traditional colors seemed like a fun way to go! Wow Chloe, how fun is this! 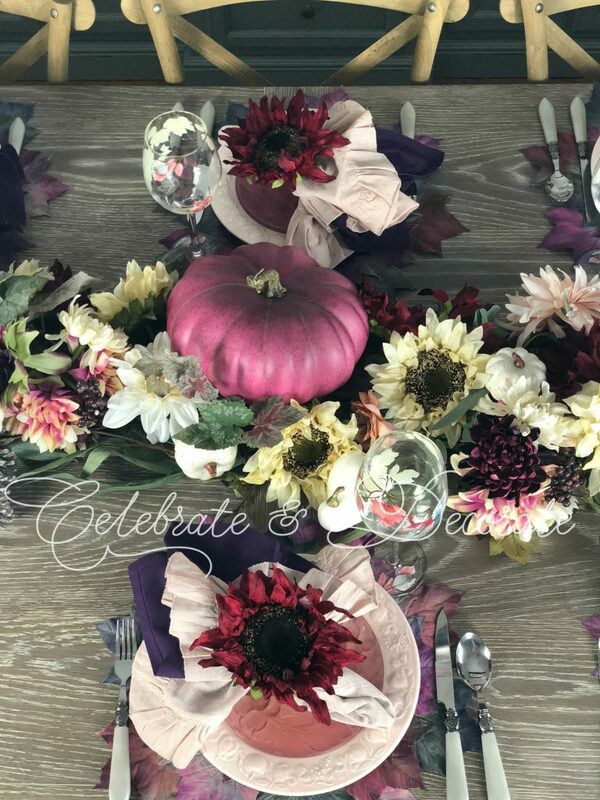 I love your pink pumpkins tucked around the white sunflowers, this is such a unique take on a fall table, and your pink pumpkins will be great for Pinktober too! Your plate stack is beautiful, as are the wine glasses. Is that a pink and purple leaf placemat at each place? I wish you had shown more of them, they look so pretty! 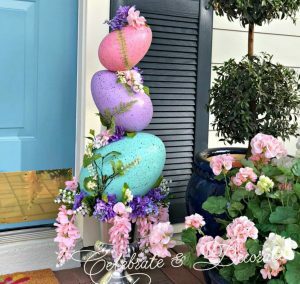 Thank you for hosting another fabulous tablescape hop! Thank you so much Jenna! I appreciate all of your participation in these group hops! Thank you so much Ann and thank you for joining us for another blog hop! 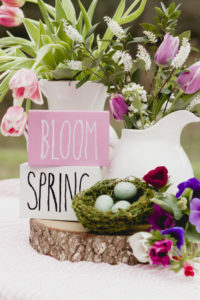 I groaned when I saw the title—-But, your tablescape is lovely—I think the pale yellow keeps it in the season and tempers the unexpected colors. Great lesson in color balancing….no groaning here now! LOL. Chloe, your fall colors are so rich and vibrant. The glasses match the pumpkins and colors beautiful. I love how the elegance of the table settings contrast with the rustic vibe of the table. Such a pretty tablescape. Thank you so much for hosting. You are a pro. 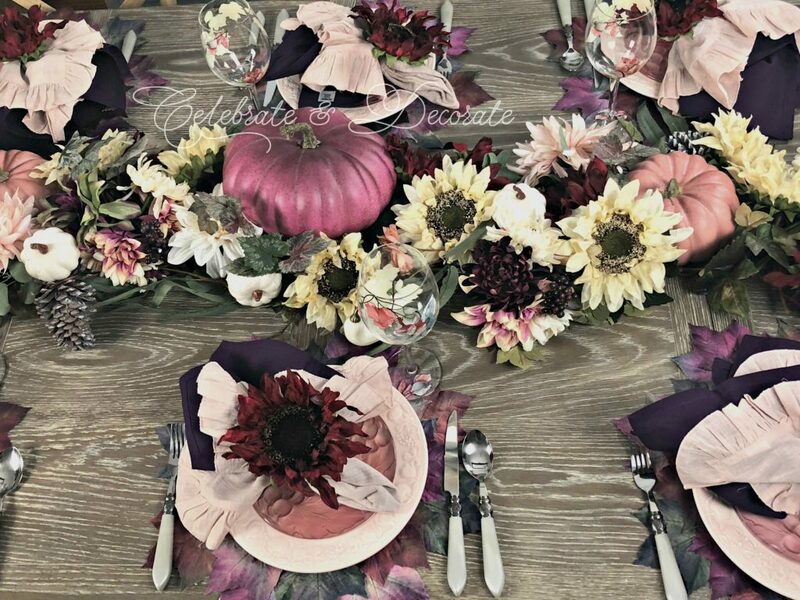 Chloe, your fall table is absolutely gorgeous! I love the rich and vibrant color palette that you chose. It creates such a striking setting. Thanks again for hosting such a fun Hop! Happy Monday!!! Oh my goodness Chloe! 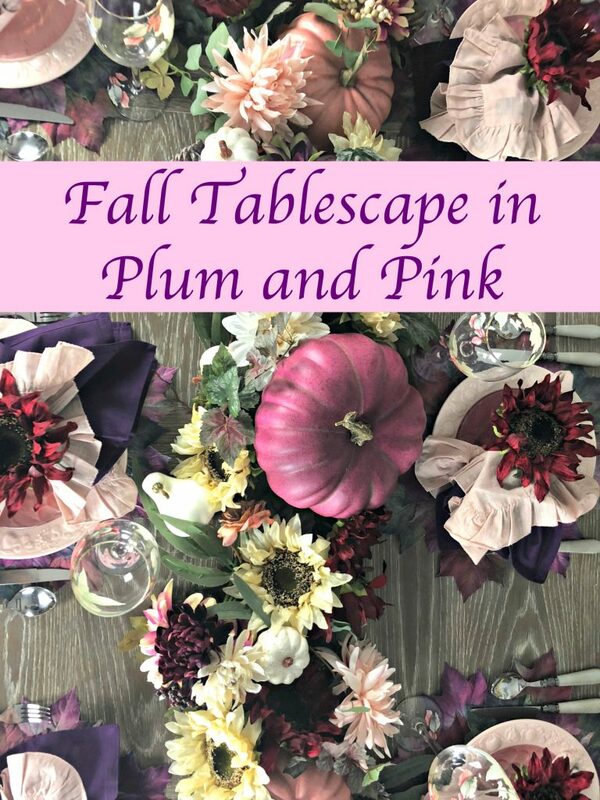 You totally pulled off a pink and plum Fall tablescape! I saw those colors at Michaels and loved them but didn’t know how I could incorporate them into Fall. Well, you totally inspired me-as always! Thank you for all your hard work in organizing these tablescape hops. I truly look forward to each one! Thank you so much Michelle! Thanks for being a part of another hop!